The Spectator: Is La Paz About to Bloom? Is La Paz About to Bloom? That was 1940. If Steinbeck had been with us on a recent one-week vacation with friends, he might have realized his prediction seemed to be on the verge of coming true 70 years later. We had gone to La Paz with friends who traded their time share in Cabo San Lucas for one in La Paz. Our research indicated we would be visiting an authentic Mexican town, more like San Miguel Allende than Cabo San Lucas—real people, not tourists. In that regard, we were not disappointed. We endured friendly natives, uneven sidewalks, potholed streets, unmarked one-way streets, blaring music from stores, sidewalk vendors who served locals, and shops closed during the afternoon for siesta. But we were also concerned by the number of condominiums and resort-marinas being built on the way to the beaches north of town. Homes advertised as selling in the low 400s and an elaborate gated community cut into the hillside overlooking the bay. We saw a Gary Player golf course under construction. Real estate guides are ubiquitous as the seagulls. The big-box stores familiar to anyone in the United States are clustered at the end of town toward the airport. Our tour guide told us that Americans (Canada and United States) and Germans were the dominant expatriates living there. It wasn’t hard to see what attracts expatriates to La Paz, a city of 200,000, and why it is starting to bloom. In addition to friendly people, the food is excellent and the streets are safe. La Paz is on the eastern side of the Baja Peninsula, but situated along the Bay of La Paz in such a way that we could watch sunsets from an outdoor restaurant while sipping margaritas and beer. The weather when we were there was mild (50 to 78 degrees) and I wore short-sleeve T-shirts day and night and switched from blue jeans to my lightweight travel trousers upon arrival. Across from our favorite watering hole was the 3.5-mile boardwalk or malecón (recently extended to the condo development north of the city). It is a favorite of the locals, who walk, jog, bike, rollerblade and exercise their dogs there, sometimes not cleaning up after their dogs. The orientation leader at our timeshare described the malecón as “an enjoyment place for everybody.” The street along the malecón is very busy and needs to be carefully negotiated by pedestrians. Jaywalking is not advised. At night, unfortunately, the street is the scene of cruising (and sometimes speeding) cars with loud radios blaring late into the evening, disruptive to those trying to sleep just a block or two in from the boardwalk. Driving in La Paz took some getting used to because of the number of unmarked one-way streets and four-way stop signs that were suggestions, not absolutes, and ignored at intersections with lighter traffic. Our city tour guide, a native Mexican who once lived in Los Angeles, said the rule was: “You go first—after me.” Drivers would approach an intersection, slow down, and if they calculated that they had arrived first, speed up through the intersection. I saw it as a game of Mexican chicken. Some of what is best about La Paz is not in the city, but outside and to the north—the beaches and the opportunities in the bay—snorkeling, kayaking, diving, sailing. Before deciding where to swim among the 10 beaches, we drove to each one. The last was Playa Tecolote, which is a launch point for those who want to go to Isla Espiritu Santo, a nearly 24,000-acre home to a variety of sea and bird life. We had a choice of three tour companies and eventually selected the least expensive after failing to negotiate lower prices with the first two. (The price included the 46-peso federal fee to go to the island, which is a protected site.) The company provided snorkeling equipment, including wet suits, for those who wanted it. My wife and I were more interested in photographing the sights and I was afraid we’d end up on some beach bored while the others snorkeled. Instead, we were not on some boring beach, but with a colony of sea lions. Add to that the various birds and fish and we had so much to photograph that I was actually sorry to leave. 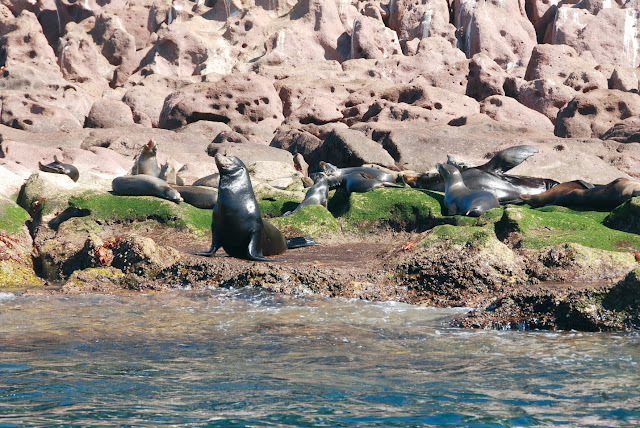 I understood why Jacques Cousteau called the Sea of Cortez “the world’s aquarium.” Those who snorkeled reported that some sea lions gently nipped them—one showed us sea lion teeth marks on her flippers. The tour included lunch at another beach on the island and a close look at other parts of the island, which is an unending and ever-changing cornucopia of rock formations on which I trained my cameras. We didn’t get to see as much as advertised because when we were picked up, our pilot, who had come in from another location, reported having seen a whale in the Bay of La Paz and so we diverted on our way to the island in the hope of seeing it. Unfortunately, no whales surfaced. As for the beaches in the Bay of La Paz, we settled on one in a cove that did not have any food or bar services. It was too shallow for swimming, but great for wading and even better for photography. Pelicans and rock formations were the subjects of our photography on beach day. We rented a car for $612 (half of which was insurance) and calculated that it paid for itself. For example, had we paid for the Isla Espiritu Santo tour from our hotel, it would have been $100 per person. We drove to the launch site and paid $40 each plus a $15 tip. A beach tour was advertised at $35 a person; we did it ourselves at our leisure and had the option to get out and explore each site. A tour to Todos Santos, a nearby art community on the Pacific Ocean, was $85 each; we drove ourselves. We did pay $25 a person for the city tour, which was extremely informative and took us to places we would have never gone in our car. The driving tips alone were worth paying for. Whether or not La Paz can sustain the growth implied in the construction we saw remains to be seen. Water is a problem and we purchased a 5-gallon bottle for drinking. The sewer system, according to a sign in one store, is so old that it stops up easily, although we received no such warning at our timeshare and had no problems. We’d like to go back with our grandchildren and hope we can do that before things change too much. Tom - this is a very nice article - I'm so glad you liked it there. Melissa and I are going back again next year for our 3rd visit and this time we are staying a month!! !